I just had to post this because it was so sweet. Geoff had taken Phoebe outside for awhile to listen to our water fountain (which is why she's wearing the hat -- a gift from Aaron and San, via Audrey - thanks guys!) 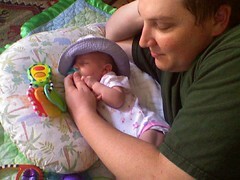 and when they came back inside, Phoebe wanted to cuddle with dad and the pacifier for a little bit. This is one of the things that make life so good.